This is probably the one question that is asked more then any other. For me the answer is easy, all they want. What's more important is how to feed them and when. I feed mine once a day in the evening and only after they fly. 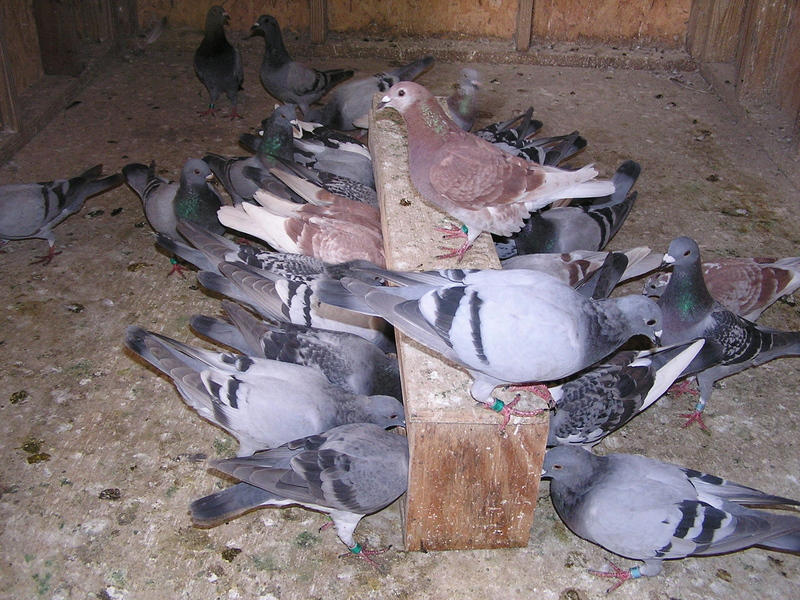 Please understand I am not road training at this time, I am loft flying the pigeons. I want them hungry every time I let them out. I also want them to go through a good molt. I try to let the pigeons out about 3 PM. It's hot here in the summer so they won't fly very long. As soon as the pigeons land I am in the loft calling them in to eat. I do this by talking, whistling and making all kinds of noises. I place about a coffee can of feed into the feeder as the pigeons come in. I continue talking, whistling and making noises. It doesn't take them very long to understand, that if I'm in the loft it is time to eat. If the pigeons eat all the feed I have given them I add more. As soon as they show lack of interest in the feed and three or four have gone to the water it is time to stop. I will let them have the few grains that are still in the feeder but that's it. Very important, if a pigeon remained out while I was feeding that bird doesn't eat. You can bet he will be among the first ones in the loft the next day. It is also important that you understand this is only after the pigeons are able to fly, not when they are still very young. I would guess the pigeons are about 10 to 12 weeks old when this feeding program starts.